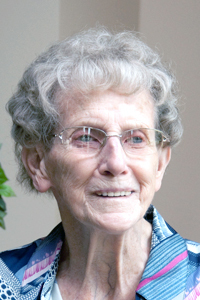 Harmina Huisman, 91, of Jewell, IA died Thursday, November 29, 2018 at the Israel Family Hospice House, in Ames, Iowa, where she had been a patient for nine days. The family will receive friends and relatives on Sunday December 2, from 2:00 – 4:00 PM at MAC Life Church in Blairsburg, IA. A funeral service will be held on Monday, December 3, at 10:00 AM at MAC Life Church, with Pastor Ron Lotz officiating. The family has chosen Boman Funeral Home (www.bomanfh.com) to care for their needs. Harmina Catherina Gelder was born on May 8, 1927, on a farm near Buffalo Center, Iowa, to Dirk and Marie Gelder. When she was a young girl, the family moved to a farm near Wellsburg, Iowa, where she grew to adulthood. On December 18, 1945, Harmina married Elton Huisman at his parents’ home near Titonka, Iowa. The couple and their family moved frequently in their early years, residing in the Titonka, Buffalo Center, Ellsworth, Jewell and Sibley communities. In 1960 they moved into the Kamrar community where they lived until 1986 when they moved to Jewell. Elton was diagnosed with Parkinson’s Disease in 1967 and Harmina cared for him at home for 23 years before he went to a nursing home. Harmina is survived by six children: Arvid (Julie) Huisman of West Des Moines; Gerald (Bev) Huisman of Webster City; David (Cindy) Huisman of Britt; Paul (Carol) Huisman of Webster City; Shirley (Mike) Nelson of Blairsburg and Trudy (Mike) Breen of Winter Garden, Fla. She is also survived by sisters Violet (Kenny) Adams of Wellsburg; Annie Hammer of Miami, Ariz. and Fannie (Carroll) Rains of Chula Vista, Calif.; a sister-in-law, Marjorie Pannkuk of Ankeny and a brother-in-law, Ron (Helen) Huisman of Hot Springs Village, Ark. She is also survived by 10 grandchildren and 18 great-grandchildren. She was preceded in death by her parents; her husband, Elton; a son, Duane; a grandson, Mark Irvin; a daughter-in-law, Cindy Fisher Huisman, seven brothers and two sisters. Memorials may be directed to the Israel Family Hospice House, 400 So. Dakota Ave., Ames, IA 50014.